Improve your gaming stream using the Turret Broadcaster Ultimate Streaming Kit for Gamers from B&H Photo. This kit conveniently bundles the HD video Marantz Turret tower system with a 15-key switcher, a dedicated gaming headset, and a collapsible green screen with a stand. Use this bundle to add pro-style switching and virtual effects while you stream your game play. The Turret Broadcast Video Streaming System from Marantz Professional combines an HD video camera, microphone, ring light, and headphone amplifier with a control tower/stand. Together, these components provide an all-in-one broadcast tool expressly designed for streaming and podcasting. The Turret System's compact, portable size suits it to both desktop and location use with the centrally located camera, microphone, and light controls placed within easy reach on the control tower. The Turret camera features full HD recording at 1080p, automatic low-light correction, a 78° wide-angle lens, auto-focusing, and both Windows and Mac compatibility. H.264 video compression is built-in for easy streaming, and the Turret includes an internal USB hub; a high-speed USB-C output minimizes signal latency. On the audio side, the Turret features a high-performance condenser mic, gain control with an integrated preamp, pop filter, and direct monitoring while recording. To add music or an effects channel, a mix control enables you to blend the mic's audio with a USB audio input. The preamp outputs a pristine signal to your headphones, enabling you to hear your audio output as your audience does. 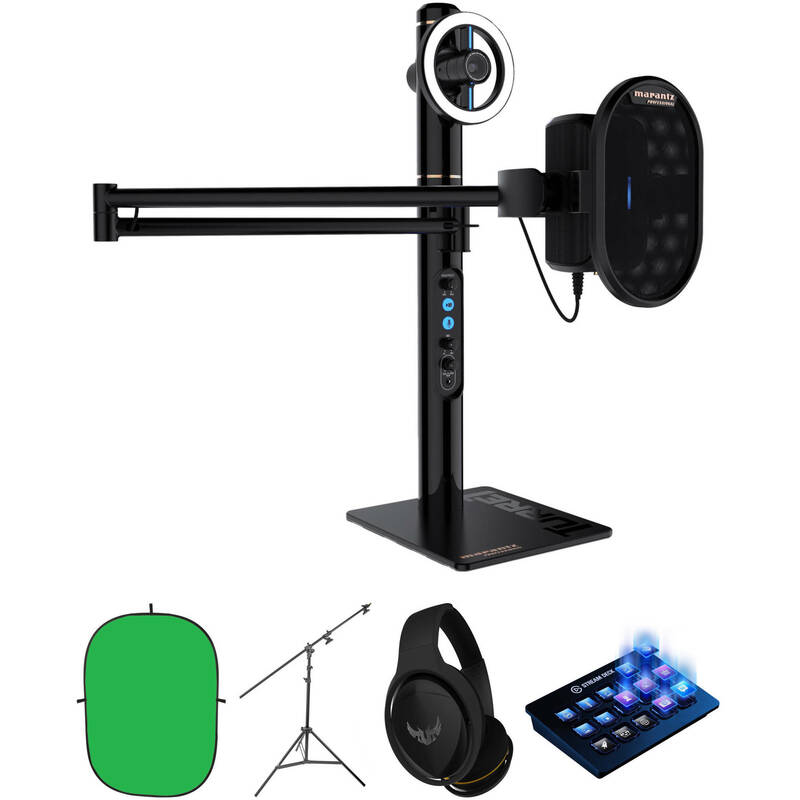 The LED ring light surrounds the Turret camera, providing even illumination of the streamer/podcaster. This dimmable, daylight-balanced LED fixture comes with cool white, and warm filters for matching to the light at your location. This Impact Collapsible Background is a small, easy to use accessory for shooting small objects or simple headshots. This background sets-up and folds easily and comes in its own see-thru storage bag. Note: Colors depicted may vary slightly, due to differences in computer monitors, printed media, and variances in manufacturer's dyes or paints. In addition, this product may be folded for storage a number of ways. This is an Impact Convertible Boom Arm/Light Stand. As a light stand, it can support a small or medium light head to a height of 13' (4 m). Raise the second section completely, click, and it is a boom stand. As a boom, it can hold a small light head to an extension of almost 3' from the center of the stand. It is a reflector holder by means of its two clips, which can support an Impact, Flexfill, or Photoflex light disc as large as 60". A hole at the end of the arm allows an optional counterweight to be hung, for greater stability. 1. Loosen the large long handle in the middle of the stand. 2. Loosen the top-most section of the stand. Pull that section all the way up. 3. Pull! - swing it horizontally for the boom feature, and lock it for the desired setup. The TUF Gaming H5 Headset from ASUS is built with onboard virtual 7.1-channel surround sound for an immersive gaming experience on PC. Simply click the button on the in-line module to activate it. With both USB and 3.5mm connectivity, it's compatible with multiple platforms and even features in-line and detachable boom microphones. Its 50mm neodymium magnet drivers and airtight chamber provides you with clear audio and deep bass while its adjustable stainless steel headband ensures it's compatible with all sorts of users. Download the optional Armoury II software to access audio settings and set up custom application-specific profiles. This headset features an airtight chamber and ASUS Essence drivers, which combine to provide you with clear audio and strong bass. Enable virtual 7.1-channel surround sound with just a click. The in-line controller has a single button toggle for immersive audio with no software needed. Whether you're gaming or on-the-go, this headset has a boom mic and an in-line microphone, so you can chat however you like. The in-line module also has volume and mic mute options for quick adjustments. ASUS Armoury II is a downloadable software that provides you with a wide variety of audio settings including equalization (EQ) and 7.1-channel speaker level balancing. You can also create custom profiles for different applications and game genres if needed. If you're an online streamer who broadcasts using Elgato Game Capture, OBS, Twitch, Twitter, TipeeeStream, XSplit, YouTube, Mixer, and more, streamline your streaming setup using the Stream Deck from Elgato Systems. The Stream Deck integrates your tools and helps to automatically detect scenes, media, and audio sources, enabling them to be controlled with the tap of a key. 15 LCD keys can be programmed to launch an array of actions, while a one-touch, tactile operation allows you to switch scenes, launch media, adjust audio, and more. Streams can also be personalized with GIFs, images, videos, audio clips, and intro and outro graphics. The Stream Deck is compatible with macOS 10.11 and later, as well as Windows 10 (64-bit). Connectivity with your host system is accomplished using an integrated USB 2.0 cable. Finally, an adjustable stand is included to keep the Stream Deck within easy reach. You're creating quality content backed by strong tech, but you want to do more. With the Stream Deck, unleash your creativity make waves across Twitch and YouTube, all while focusing on what matters most: your audience. Fifteen LCD keys poised to launch unlimited actions help eliminate the need to map and memorize keyboard shortcuts. One-touch, tactile operation lets you switch scenes, launch media, adjust audio, and more, while visual feedback confirms your commands. Stream Deck integrates your tools and automatically detects your scenes, media, and audio sources, enabling you to control them with a quick tap of a key. Compatible platforms include Elgato Game Capture, OBS, Twitch, Twitter, TipeeeStream, XSplit, YouTube, Mixer, and more. Automated alerts help make life easier, but between thanking donors and welcoming new subscribers, there's ample opportunity for self-expression. Employ Stream Deck to level up your on-screen antics with GIFs, images, videos, and audio clips. While you're at it, apply lower thirds and bookend your content with signature intro and outro graphics. Your options are vast, so explore and experiment. Do what you must to sharpen your creative edge, and do it with a personal touch. Customizing Stream Deck is user-friendly. Simply drag and drop actions onto keys and make them your own with custom icons. Need more actions? Nest folders within folders to amass more actions. Better yet, save unique key configurations as dedicated profiles for different games and apps, switch between them on the fly, and share them with fellow creators. Gone are the days of navigating a myriad of windows to trigger an action, and relying solely on automated plug-ins to expand your production value. Now, you hold the power to pioneer an era of content creation and lead your audience to frontiers of inspiration. You're in control. Box Dimensions (LxWxH) 24.0 x 20.5 x 13.0"
Box Dimensions (LxWxH) 28.0 x 28.0 x 1.0"
Box Dimensions (LxWxH) 42.0 x 4.8 x 4.8"
Box Dimensions (LxWxH) 11.2 x 10.8 x 4.2"
Box Dimensions (LxWxH) 7.6 x 5.8 x 1.7"